24 November another beautiful day in paradise waiting on the same bus I’ve been taking to work every day for the last one and a half year. I see the shimmering light of the bus’ window reflection on the top of the hill, I get in line to board, I hear the bus driver say “you cannot pay cash!” to the passenger in front of me, I quickly jump in thinking I can explain to him that he is wrong, after all, I received an email from Translink several days ago and it’s not till 2010 that you can’t pay cash anymore! He wouldn’t hear of it, so I ask “do you mean to say we need to get off the bus because you don’t accept cash! ?” his short answer was “yes”, a few more unkind words were exchanged that I normally would not dare take in my mouth in public, but I can tell you that I was very displeased with the disorganized planning of Brisbane’s transport. I think I can also speak for the other countless people I saw still sitting and waiting at the bus stop (for a bus that does take cash) when I drove by in the car half an hour later than normal. when I called Translink on 13 12 30 at 8:06am 23 Nov I got to speak to John who was adamant that the bus service I’ve been taking had already stopped taking cash months ago “sorry John, but don’t tell me that I’ve not been paying cash up till today”, “John, let me speak to your supervisor”……. 6 minutes on hold, yes, six whole minutes, I assume he was hoping for me to hang up instead I was keeping track of time so I could include it in my complaint to Translink, again John came back on the phone repeating himself, not putting me through to his supervisor, I started wondering whether John could actually put me through since he sounded like he was in a country where the number one job is telephone customer disservice, you know what I mean, I gave up! Let’s talk about this go card or (go kart as my wife understood I was needing to buy to get to work). First of all I don’t like to be forced into something, secondly I really hate it when a large organisation like Translink can’t plan something this important properly, thirdly, what in gods name am I going to do when circumstances arise where my go card credit plus topping has run out? Let’s say I can’t top up my card in time, don’t have access to the Internet or the time to do it, I certainly can’t pay with CASH! I guess I better train up to be Brisbane’s fittest so I can run to work. “Single trip paper tickets will still be available under the new fare structure until they are removed in December 2010.” 2010 hence my surprise when being kicked out of the bus while still in 2009. “go card users have realised how much easier travel is when not having to fumble through their bags looking for change, buying a ticket and putting away their change”, instead I now carry around two kilo’s in coins that I can’t spend on the bus anymore every day. “With a pre-paid ticket or go card there is no need to look for change and fewer delays when boarding the bus, helping both passengers and drivers have a stress-free trip.” stress free!? You’ve just added to my already stressful day by having to think about touching off when exiting, not to mention all those times these go box gadgets on your buses don’t work, euh is it 20% of the time they don’t work or more? 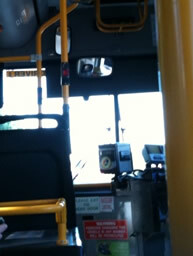 What about when you’re waiving it for 30 seconds only to find out the bus driver hasn’t turned it on yet. “There will be a two-week amnesty so passengers can still buy tickets if they need to on board buses until Friday, November 27.” I guess my bus must have been an exception to the rule, ooh and John, how can you say my bus has been paperless for months? Yes I see the advantage of the go card, but don’t stop accepting cash and force me to use what YOU think is best. PPS. Is this part of a bigger conspiracy to phase cash out all together? Entry filed under: Other. Tags: go cart, gocart, pre-paid, prepaid, translink. Also, what about when the card is broken, no way to pay with cash, what then, will you need to get of the bus and get yourself a new card? What about when you forget your go card? Where else can you NOT pay with cash, tell me that? Honestly, I hear nothing but complaints about the phasing out of cash every morning I’m on the bus. I see bus drivers letting people on without paying because they feel the same way about this silly decission. Wonder how much money they are losing? 3 December another client who doesn’t have a go card, she’s told to wait for the next bus that does accept cash, this bus happens to come 20 minutes later, never mind it’s not going to the same places! I hear the rest of the bus mutter something like “what a craziness”…. What a pathethic outfit! It gets crazier and crazier, you’d expect translink to be able to tell you why a bus is 30 minutes late or when it will arrive, but no “we can only give timetables”, well, who do I talk to? “errr I don’t know” I guess there is no one to talk to, all I can do is wait in the blistering sun, hoping that the bus will come at some stage. Which btw it did, it arrived at 8:34am Friday 4 dec. half an hour late! Here is this mornings email to translink, I could probably write a book about this very soon – Hello, I know my message to you is going to do absolutely no good as you’ll reply with “spoke to the driver, he said he was on time” and that’s the end of it. The fact of the matter is, my clocks are insync with the correct time and I know perfectly well when a bus is early or not. Either way, this message is just a formality, I will start recording these events from here on out with my phone and will present them to the tv, I am ofcourse talking about the bus 341 on Graham road that was supposed to arrive 8:04 but arrived and left at 8:02, how am I so sure you ask? Because the bus going in the opposite direction was on time at 8:03 but even though I was running towards it on the road waiving my arms and the bus driver clearly seeing me (how can he not when I’m infront of him 10 metres away in a bright red shirt). The driver decided to be his cheerful self with his pony tail and just drive off, I can’t believe this person is still working for translink surely you’ve had countless of complaints about this guy that shows no love for his job and takes every opportunity he can to make the life of a traveller misserable, a pay back for which he clearly demonstrates is his miserable job. ps. How does someone pay your fare with their go card? Thank you for contacting TransLink regarding boarding prepaid service with your go card showing insufficient funds. We have noted your comments and requested advice from Ticketing and Fares Policy Department. Please be assured that we will be in contact with you as soon as we receive information addressing the issues you have raised. In response to your question how someone else can pay for your fare using their go card, this is not possible. A go card, like any debit card, is for the use of the cardholder or a nominated authorised user only, and is not transferable. I will await further feedback. In regards to someone else paying with the Go card for my trip, I guess no one will ever be able to pay my fare then since you don’t accept cash on the bus, is that correct? I had to enjoy 3 more people being put of the bus this morning because they could not pay cash… I can tell you they were not happy at all! 3 Jan 2010 another unhappy customer who was not aware that cash was being phased out, and I’ve seen this person quite regularly on the bus before. Wednesday 6th of January 8:05 bus 341 – two people wanting to get on the bus, they got kicked of because the had no go card and could not pay cash. Their response was “what the hell?”. What about foreigners coming to Brisbane? I just saw a funny scene with a French couple, bus driver trying to explain “this is a prepaid bus”, ha ha, seriously, did they do any thinking about this at all?? Someone’s card wasn’t working, guess what the drivers said “not my fault, translink’s fault, translink is the government, I’m Brisbane city council. I can’t let you on unless you pay, I can’t take money of you because this is a prepaid bus!” bus driver was pretty annoyed, but bloody hell, it sure isn’t the problem of the traveler, he put the money on the card like he’s been asked to do, and he had cash on him to pay for his fare!!! Another very GOOD reason why the Go Card is doomed to fail! What a waste of good tax payers money! I hate you translink… you greedy pigs. I hope all of you die painful deaths. I especially like your question at the end about phasing cash out all together. All your arguments are well said. Totally displeased with Go Card. A ticket from Montague st to Boundary st cost me 4.44 dollars today – as opposed to what the paper tickets used to cost. Perhaps it’s a conspiracy so people have less and less money too? agree with zero..translink are another branch of Satan enslaving the people. I suggest that all unhappy people write/email to their state local member of parliament and to your local newspaper editor or even better get on talkback radio as they hate to hear any criticism being aired publicly – the more the better as they hate to hear any complaints where all punters can see. People power can win if the pressure is constant. Translink debited my go-card $10 three times, I realised this a few months later when going through the go-card transactions. Just got off the phone with their friendly go-card operators and was told sorry no refunds after 8 weeks. Translink will now keep the money. Thank you translink. This was for a $4 fare.